I have performed tests to check the cross browser compatibility of the SharePoint 2010 Beta version. As announced by Microsoft, it is good. For example, some of the most exciting advanced graphic functionalities using Ajax in SharePoint 2010 wiki page are working well for Internet Explorer 7 and Internet Explorer 8, but also for Firefox 3.5 and Chrome 3. But some browsers are still missing interesting functionalities and I thought it was important to post about it. 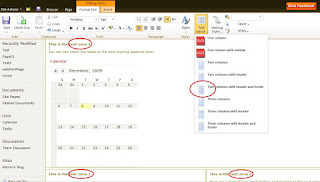 One of the most amazing features supplied by SharePoint in the old 2007 version and the new 2010 version is the possibility to move a web part from a zone to another one by simply drag and dropping the web part. In order to perform advanced tests regarding the cross browser compatibility of SharePoint 2010 I have tested this functionality with the two latest version of Internet Explorer, and the latest versions of Firefox and Google Chrome, since drag and dropping web part within a page in edit mode is maybe one of the most tedious thing to implement in order to have the same result for several different browsers. However, what's about moving a Web Part from a zone to another one by drag and dropping it and the cross browser compatibility? But to be sure to actually move it you must release the mouse button when you see the caret appear in the place where you want to move the Web Part. Don't forget to save the page, otherwise all is to do again from the beginning. 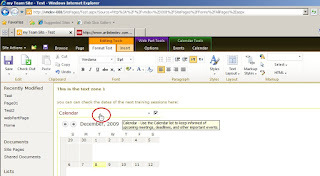 Although there is a warning pop up while exiting the page, you will certainly forget to save the page while moving Web Parts in SharePoint 2010 wiki pages, because you have not to save the page when you perform the same operation in a Web Part page. In a Web Part page, you just have to exit the edit mode and it's done. I did not succeed in making it works neither in Firefox, nor in Chrome. Furthermore, if you have to scroll the page to access to a destination text zone you will have to use the mouse wheel while drag and dropping the Web Part! Not always very easy... This tip for moving a Web Part can be performed only in Internet Explorer 7 and Internet Explorer 8. If you want to succeed in drag and dropping a Web Part from a zone to another in a Web Part page use Internet Explorer 7. 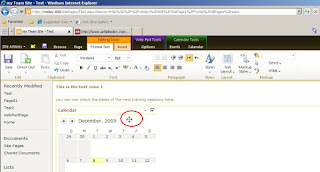 The drag and drop does not work at all in Firefox and Chrome, it works in Internet Explorer 7 and Internet Explorer 8, but you cannot scroll the page while drag and dropping the Web Part in Internet explorer 8! The document libraries Explorer View failed to display in Internet Explorer 8 when I tried it with the Beta version but it seems to have been fixed and I have succeeded in making work on Windows Server 2008 R2 and Windows Seven. I have to re test it on XP. However, it works like a charm for Internet Explorer 7. For the other browsers, the functionality is displayed as disabled. Here is a table summarizing some of the SharePoint 2010 functionalities discussed in this post, and their availability for IE 7, IE8, FF 3.5, Chrome 3.0. So, Internet Explorer 7 is still for me the best web browser to use for browsing a SharePoint 2010 site. Nice post. I would also add that Project Server 2010 will not even load for any non IE browser. for your appreciation and the complementary information.